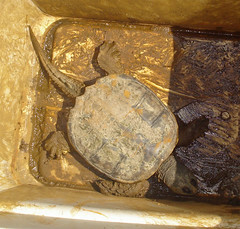 This is the snapper the neighbor found on our street. We are at least a quarter mile from any body of water. Are you going to look for turtle soup recipes then? I'd rather look up schematics for a catapult. When I was a kid there was a turtle who lived in our back yard. My dad named it "Soup." It took my little sister ten years to understand why. I still have no idea how some of the box turtles got into our back yard, far as I know there are no gaps in the fence. Maybe they wait for me to leave the gate open and make a dash for it. We used to find turtles in the yard all the time out there. Usually just the smaller box ones, though. The box turtles I don't mind, when I find one in the yard or on the road I'll release it in the park nearby. Snappers, they get deported to Clinton, I guess. Fine with me.